Most common chronic joint condition. Affecting approximately 30 million Americans. Osteoarthritis (OA) is the most common form of arthritis (condition that affects joints) worldwide, affecting with millions of people. OA can damage any joint, but most often affects joints in the knees, hands, hips and the spine. In most of the cases it is age related condition and occurs when the cartilage of the joints gets damaged over the time. The most characteristic symptoms of osteoarthritis include pain, morning stiffness and swelling of the affected joints. And although the symptoms can be managed, the underlying reason could not be resolved. The bones at their ends are coated with cartilage that protects them from rubbing and damaging each other while moving. Over the time, this cartilage thins so bones start to rub each other, and symptoms like pain and swelling appear. This rubbing causes the surface of the bones to become rough and boney growths appear. At the start, the body tries to repair the damage and joints loosen their ligaments and smooth tissue to allow the joint to work normally, so these changes are not manifested by any symptoms. But over the time, the damage of the cartilage and bones gets bigger and symptoms appear. Age – it’s the most important risk factor. 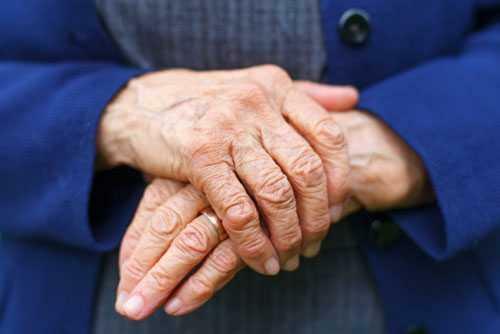 Almost all people over the age of 65 show signs and symptoms of arthritis. Gender – statistics show that until age of 45, it is more common in men, and after that in women. What Are Common Osteoarthritis Symptoms? Stiffness – especially at the morning and after period of inactivity. Usually last half an hour. Our San Francisco chiropractor will ask you few questions about your symptoms, when did they appear, how long did they last, did symptoms affect your daily activities, are there any trigger factors, etc. During the physical examination, the SF chiropractor will look and touch your joints to check them for pain, swelling, redness, tenderness and to determine the range of motion. Lab tests and imaging tests will be done also. Lab tests include blood tests and joint-fluid analyses. Blood tests are mostly used to exclude other causes of pain and other types of arthritis. Imaging tests include X-ray and MRI, and are used so the changes in the joint can be seen. The cartilage is not visible on X-ray images, but other characteristics like roughness of the bone e narrowed joint space are signs that the cartilage is thinned and damaged. The MRI is more expensive than X-ray, but will provide better images, and early abnormalities can be seen. What Is The Best Osteoarthritis Treatment? As mentioned before, it is important for person to understand that although the symptoms can be managed, the condition itself can’t be cured or reversed. The treatment is a combination of lifestyle changes, medications, physical and alternative therapies and sometimes surgery. Lifestyle has a big impact on the development and severity of this condition. Many of the symptoms are triggered by factors that easily can be managed. Lifestyle changes include weight control, mild physical activity, and healthy nutrition. Some studies suggested that specific foods improve the symptoms, this is due to the anti-inflammatory capabilities that some foods have. These include food rich with antioxidants (vitamin A, C and E), fish and fish oils, dairy products, dark leafy greens, broccoli, green tea, garlic and nuts. You should also work on reducing the cholesterol. Medications are used to reduce the pain and inflammation. Most commonly used are acetaminophen (Tylenol), nonsteroidal anti-inflammatory drugs (NSAIDs), such as ibuprofen and naproxen, and Duloxetine (Cymbalta), which is an antidepressant and is used to treat chronic pain. Physical therapy includes a tailored exercise program that will increase the range of motion of the affected joints and will reduce the pain. Regular exercises such as walking or swimming can be also effective. Occupational therapy includes help from professional (occupational therapist) to find the easiest ways to do everyday tasks without or with less pain. Tai chi and yoga are movement therapies, that work through reducing the stress, and studies suggest that can improve the symptoms and reduce the pain. Chiropractic care is very effective in reducing the symptoms when the spine is vulnerable, but it is suggested that regular chiropractic treatments can prevent further arthritic development, once the osteoarthritis occur, and even prevent OA changes in the first place. Not only that chiropractic will reduce the pain, but will improve range of motion and all other arthritic symptoms too. Our San Francisco Acupuncture treatments are easy and relaxing way to reduce the pain. And when none of the previous treatments work, surgery and other invasive procedures are considered. This includes corticosteroid injection in the joint to reduce the inflammation and relieve the pain, lubrication injections to ease joint movement, realigning bones, this is a surgical procedure where the bony growths are removed and the bone wedge is added or removed, and joint replacement is the last option, where damaged joint surfaces are replaced with plastic or metal parts.